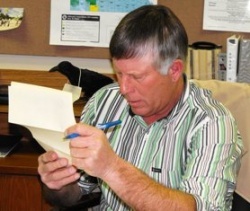 Western District Commissioner Ricky Zweerink reviews bank bids for backhoe financing. PULASKI COUNTY, Mo. (Feb. 18, 2010) — Pulaski County Commissioners voted Thursday to spend an additional $1,891.20 on upgrading the county’s telephone system after Fidelity Communications representative Greg Flint explained that the additional up-front cost for equipment would cut the county’s phone bill by $312 per month. Fidelity Communications obtained the county’s telephone service contract several years ago from Embarq, which previously provided phone service to the county and had installed a system that provided one outside line per telephone handset. The two companies submitted competing bids recently to provide county phone service, and Flint convinced the commissioners that spending $47,848 to replace the county’s telephone system and internet service with different equipment that has a lower number of outside lines would better serve the county. The additional bill submitted on Thursday happened because the Pulaski County Sheriff’s Department needed additional internet bandwidth, Flint said. “I want to thank the commission for the confidence you’ve placed in Fidelity and we’re going to work our tails off to prove we’re worth giving us the business,” Flint told the commissioners. Flint told commissioners that they had the option of signing a contract with Fidelity for a lower number of years but said he recommended a five-year contract to lock in the county’s rates. Responding to questions from commissioners, Flint acknowledged that he couldn’t predict future developments in telecommunications but said his company’s phone hardware uses a modular design that should allow service personnel to upgrade to newer equipment if needed. Western District Commissioner Ricky Zweerink agreed that signing a five-year phone service contract makes sense. “It sounds like a win to me, guys,” Zweerink said. Zweerink and County Clerk Diana Linnenbringer both said they’ve been pleased by the way Fidelity personnel have answered customer service questions and resolved concerns. Zweerink said he was especially appreciative of the way Flint handled the bidding process in comparison to the Embarq sales representative, who attempted to modify his bid after he came to the county commission. The commissioners also voted to accept a bid from Security Bank to provide financing for backhoe purchases at a rate of 4.9 percent interest. Other bidders included US Bank, which proposed a 4.7 percent rate plus a 1 percent origination fee, First State Bank which proposed a 5.0 percent rate, and Mid-Missouri Credit Union, which proposed a 6.5 percent interest rate if the county had no funds on deposit or 6.25 percent if the county chose to place funds on deposit with that financial institution. •	Eastern District Commissioner Bill Farnham asked Linnenbringer to look into whether the towing charge to take a Mack truck to the dealer for service would be covered by the warranty since the towing bill was “extremely large.” The towing bill ended up at $680, Farnham said. • Only two newspapers, the Dixon Pilot and Waynesville Daily Guide, submitted bids to print this year’s county financial statement. Commissioners awarded the bid to the Waynesville Daily Guide, which proposed to print it for $700, rather than the Dixon Pilot with a $995 bid. • Linnenbringer reported that the director of the Pulaski County Sheltered Workshop, Linda Gifford, told her that Crocker resident Janet Foster is willing to fill a vacancy on the Senate Bill 40 Board, which in Pulaski County, provides funding for the sheltered workshop. Both Zweerink and Presiding Commissioner Don McCulloch said they know Foster and consider her to be “excellent” for the post; the commissioners voted unanimously to appoint her. “She would have been the first on my list. She is an excellent girl,” Zweerink said. • Sarah Traub, the county program director for the Pulaski County Extension, told commissioners that the Extension Council will hold an award ceremony on Feb. 22 at 5:30 p.m. in the Price Cutter restaurant and invited the commissioners to attend.